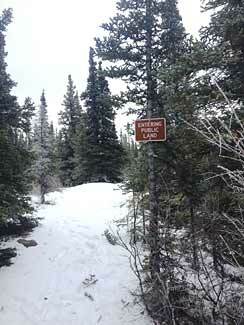 This 17(b) trail provides hunters legal access across private lands into a popular hunting area. The 1971 Alaska Native Claims Settlement Act (ANCSA) directs the Bureau of Land Management (BLM) to convey 45.5 million acres of public land to village and regional Native corporations. Section 17(b) of ANSCA provided for the reservation of public access easements which are now commonly referred to as 17(b) easements. ADF&G reviews proposed conveyances to Native corporations and recommends that BLM reserve 17(b) easements to provide public access across Native land to public lands and waters. The type of 17(b) easements that we request under current regulations include: trails (25-foot wide, 50-foot wide, and 60-foot wide); one-acre site easements for aircraft landings, vehicle parking, temporary camping, and loading or unloading. Hunting, fishing, or any other kind of recreation is not allowed on a 17(b) easement because the underlying land belongs to the Native corporation. Because of the state's size, a large percentage of the trails reserved are currently undeveloped and unmarked.